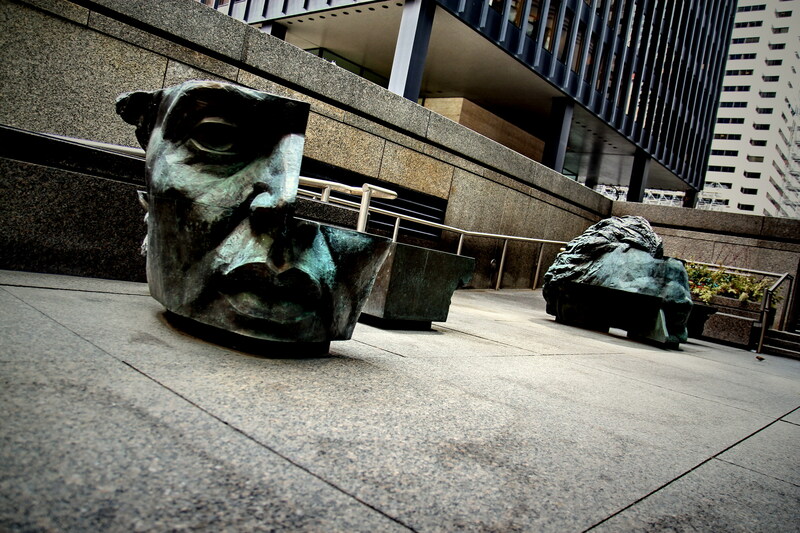 This entry was posted in Canon EOS T2i / 550D, Downtown Toronto and tagged Art, Digital Photographs, Digital Photography, Downtown Toronto, Photo Art, Photographs, Photography, Photos, Sculptures, Street Photos, Toronto, Urban. Bookmark the permalink. Interesting subject, no doubt, but I like this shot especially for the way it is framed. Thanks Mauro. I think if I’d had a wider lens I could have gotten a really funky lens distortion. I think I can imagine the rejected title. Now I’m giggling to myself uncontrollably. hehehe… Well, um…they are very…interesting benches to say the least. And I like the way you shot the scene tilted. To me it looks like a collage with paper faces cut up and out and put on a city street scene. Very interesting benches and photograph. Thanks Lynn. Yeah, it does sort of have that look. LOL, that’s downright filthy…just kidding, awesome shot Dave. Thanks Bob. That’s why I changed the title to something less controversial.